Brett and I have a favorite Mexican joint we go to and end up eating there once or twice a month. I go there for two things. 1) Their chips and salsa and incredible bean dip, and 2) their bean and cheese burrito (wait, that’s three things!). Really, I just go for the beans. Kidding. Kind of. Bean and cheese burritos are kind of my favorite thing to eat at any Mexican restaurant, but this one is by far the best I’ve had. Some people think I’m boring for ordering it but I just think I’m smart (it’s delicious and cheap!). Old El Paso invited me to create some new recipes for their Traditional Refried Beans , and all I could think about making was a tasty bean and cheese burrito. But because everything is better in bite-size portions and with March Madness just a few days away (for all of you basketball fans reading this blog! ), I thought these Bean & Cheese Burrito Bites would be perfect. To make them all you need is some Old El Paso Traditional Refried Beans, a few seasonings, diced green chiles, and uncooked flour tortillas. Mix the beans with some garlic, cumin, diced green chiles and lots of cheddar cheese! Then, slice the tortillas into four equal triangular pieces. Place a heaping scoop of the bean and cheese filling at the point of each tortila. Roll the tip up, then fold the sides in (overlapping the seams), then continue rolling the burrito over then placing the burrito seam side down on a lightly greased baking sheet. Then bake ’em for a bit until the tortilla is cooked and the bean and cheese filling is hot and super melty! Dip these babies in salsa, sour cream, or just enjoy with a side of chips! 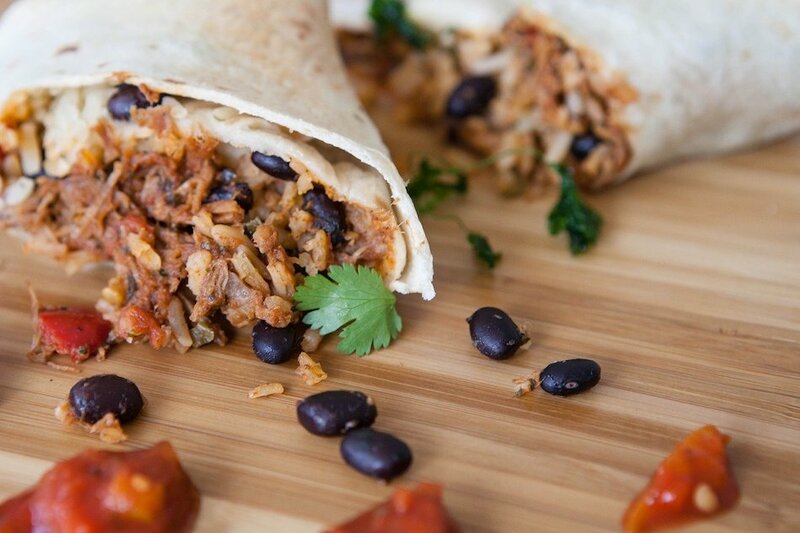 these bean and cheese burritos are a great appetizer or snack and come together in 20 minutes! Using a pizza slicer, slice the tortillas into four equal triangular pieces. Set aside. Mix the beans, cumin, garlic, salt, pepper, and cheese in a small bowl. Place a heaping tablespoon of bean mixture on the tip of each triangle. Roll the tip up, fold over both sides (overlapping seams as you fold), and then continue rolling until all seams come together. Try to overlap edges of the tortilla as best you can as you roll the mini burrito up, if you get a few oozers, no worries. A good and cheesy burrito always oozes a little. Love this idea! Looks great! Looks delicious! But, what’s your fave mexi joint?! La Costa in American Fork! Let’s Go!! These look really delicious! I think my husband would love these! I love bean and cheese burritos. I have never seen uncooked tortillas. Did you make them from scratc? Hi Kelly, they aren’t made form scratch– you can buy them at most grocery stores! They basically just require to be heated for 1-2 minutes each side to cook the tortilla! I was going to ask where it was, but I see Carrian did! I love that you made these bite-sized – everything is better when it’s mini! I also have never seen uncooked tortillas! I want to make these, maybe my 2 year old would even eat them. Thanks! I know you can by them at Costco for sure! But it’s a huge package. Most grocery stores have them as well. They are located by the cheese at my grocery store. And Lisa, my 3 year old LOVED them! But you could also just use a regular tortilla! Kristy!!! These are NOT for real. I mean, they are bite-sized, they are baked, they are beany, and they are BURRITOS!! Can you sense my enthusiasm?! Must make NOW! I am in LOVE WITH THESE. I am addicted to the bean burritos at Taco Bell, lol. Totally making these soon! Love this idea! I bought one of those mini pie pop makers and I think I will try these in it…I lvoe all things bite size! Made these for dinner last night. So good and so fun! Thanks for sharing!